A comical fantasy adventure on a fight against invaders from another world. The ruler of dark world "Don Kurai", Dark, plots to dominate the human world. There is a legend about three treasures and a hero in Don Kurai, and Dark takes over one of the three treasures, a bell of copper, but a man sent other two treasures (a spear of gold and a shield of silver) to the human world. Shinnosuke falls into Dark's trap and opens the door between the human world and Don Kurai, but he becomes the hero selected by the spear of gold. With the power of a girl from Don Kurai, Mata Tami, the Nohara Family transform into various things and fight against Dark. 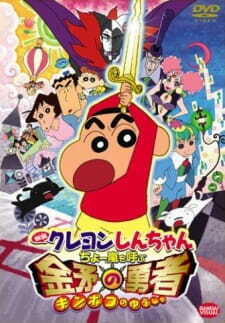 Prequel: Crayon Shin-chan Movie 15: Arashi wo Yobu Utau Ketsu dake Bakudan!